Another Dancers’ Bazaar – all done! CLICK ON THE PHOTO TO SEE MORE SHOTS FROM THE DAY! IMG_2466.JPG, originally uploaded by Halyma. The vendors… the volunteers… the shoppers…. There are so many people that make each belly dance event in Ottawa fun to be a part of. We all learn, and grow and see the development of each other through these stages and events. I love to see the teachers talking to their students, either just as the student is about to buy something and is asking advice, or just as the student has found the perfect item, bought it and is now proudly showing it off. 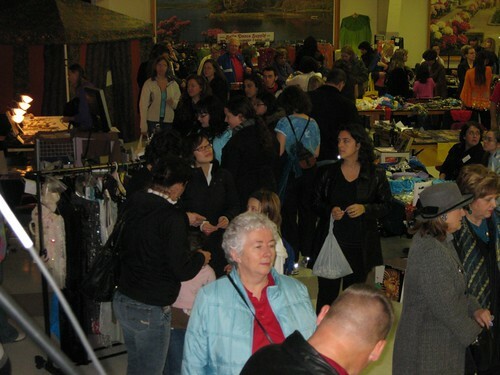 I love to see the look of sensory overload on the faces of the first time Bazaar attendees. It can be overwhelming for sure, but it makes sense to have a plethora of things to offer and a variety of price points, and styles from which to choose. And after a few loops, they seem to settle in and find what they are looking for, or at least make contact with someone who can help them get it in the future! I am grateful to the vendors who return each time, even if sales fluctuate from one event to the next as we roll with the economy, the changing times, styles and trends in belly dance and life in general. There are some amazing teachers from all across Ontario and Quebec who spread the word, letting their students know about the Bazaar, suggesting they attend and helping them with ideas of what to look for so that they can come with a plan! While there is a lot of work that goes into organizing any event, and some occasional challenges make the planning of the Dancers’ Bazaar more than usual, I know that there is a purpose to it, a community that comes together to meet, share and reconnect at it, and that is fabulous. PS. EVERYONE who bought some Eco-TAV products is invited to enter the Eco-TAV video contest – go here for details!